The crew of the Bahamian Queen invites you to the hottest party of the Caribbean during a day out of boozing, cruising, snorkeling, and sunbathing. This cruise is jam-packed with entertainment and excitement. This daytime party is the best way to leave your troubles behind and soak in some tropical music, sun, and drinks. Relax on this spacious multi-deck boat with a cocktail in hand. The bar on ship offers unlimited mixed drinks. Enjoy the fruity yellow bird, made with banana and coffee liquor, rum, and pineapple and orange juice mixes. The Goombay Smash, with coconut rum and apricot brandy, is always a hit. And there is always the famous Bahama Mama rum punch. Soft drinks and water are also available. The cash bar is stocked with beer and wine. don't worry, we'll provide the transportation back to your hotel after the party. No Caribbean party would be complete without a limbo contest. Experience the island's own Junkanoo version of the limbo. If you can't decide whether to be a spectator or a participant, the crew will offer liquid courage in the form of wine and cocktails. If you are not limber enough for the limbo, join dancers on deck grooving to the tropical beats of the island. If you would rather get off the boat and into the water, the crew has you covered. Grab some equipment and enjoy snorkeling among the reefs. The Caribbean is famous for clear water and colorful marine life. We'll end the day on one of the island's secluded beaches, where you can cool off in the ocean waters, drink in the sun, and comb the beaches. What kind of drinks are served on this trip? This trip offers unlimited tropical drinks, like yellow birds, goombay smashes & bahama mama rum punch. 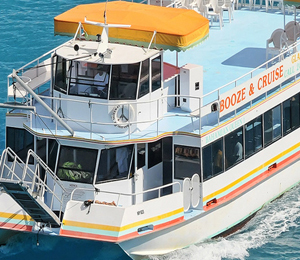 I have been to the Bahamas many times, but Bahamas Booze Cruise and Snorkel is one of my favorite trips! It includes everything that everyone should do here. As a Bahamas veteran, I can say only the best about this experience!